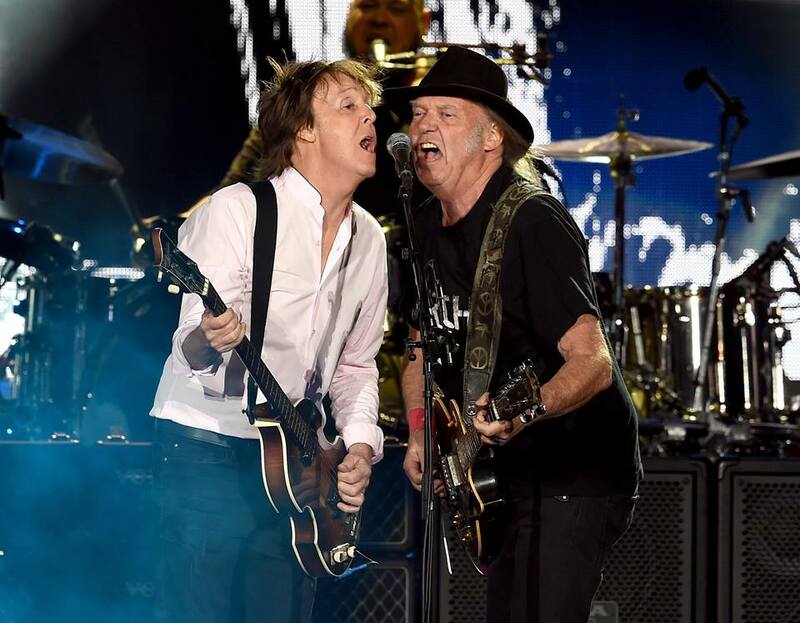 Neil Young joined Paul McCartney for a pair of Beatles classics at the Desert Trip festival in Indio, CA on October 8. Following his set with Promise Of The Real, Young sat in with McCartney for “A Day In The Life” and a snippet of John Lennon’s “Give Peace A Chance,” before returning for The White Album track “Why Don’t We Do It In The Road”, a song McCartney has never performed live before. Both acts delivered full headlining sets on the second night of the opening weekend of the new classic rock festival – running October 7-9 and 14-16 at the Empire Polo Club – which sees the Rolling Stones and Bob Dylan perform on Fridays, McCartney and Young on Saturdays, and Roger Waters and The Who on Sunday evenings. Young will next perform two shows at the Fox Theater in Pomona, CA on October 12 and 13 before returning to Desert Trip for another set on October 15; a week later, he will host his 30th anniversary Bridge School Benefit Concerts at the Shoreline Amphitheater in Mountain View, CA on October 22-23. The 2016 lineup will see acoustic sets from Metallica, Roger Waters, Dave Matthews, My Morning Jacket, Willie Nelson, Norah Jones, Cage the Elephant, case/lang/veirs and E Street Band guitarist Nils Lofgren.